Log into Google Takeout through your Google account (if you have Gmail, you have Google Takeout). Either find it at the Google Takeout website or through the nine dots in the upper right corner of your Google page. If you’ve archived Google data in the past, that event appears at the top of the first screen. If this is your initial use, select the data you’d like to archive from the list provided. On the next screen, select the file type you’d like or accept the defaults. Next, select how you’d like the data delivered — a download link delivered to your Gmail or added to your Drive, Dropbox, or MS OneDrive account. All data is exported as a ZIP file that can later be uploaded or exploded. The download may take a while depending on how much data you have. If you prefer, you can transfer rather than export. This takes longer and the action will notify you via email when it is completed. All files are collected into one ZIP file making storage and identification easy in preparation for future use. Because Google Takeout makes a copy of files, this can also be used to backup files in any of the listed Google products. 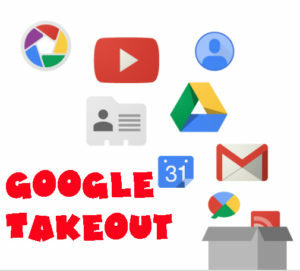 When you run Google Takeout, make sure you’re signed into the account you want to copy and no other Google accounts. Double check this by clicking your profile picture in the top right corner of the website and verify it shows only the account you want to archive — no others. Files are collected in multiple file formats, depending upon the application they serve, and will only open in that program. If you are archiving a school account, your IT folks will have to enable permissions on the Admin side to allow you to do this but once that’s done, it’s easy! Google Forms and Sites may not be transferred, depending upon your setup. Instead, simply share them with your new account. 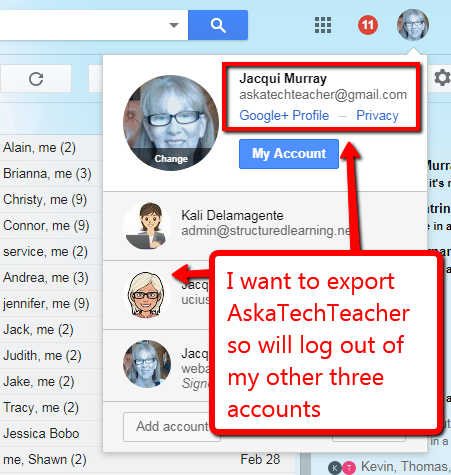 There are some differences to transferring data from a school Google account and a personal Google account. If this is the first time you are using Google Takeout, follow directions carefully so you have no difficulties. A student is moving to a new school. This is the most popular reason and the original purpose of Google Takeout. Seniors who are graduating or students who are transferring to a new school want the files they created at your school. Takeout is an easy way to make that happen. You are changing jobs to a different school district. With your school’s permission, you can move all of the files to your new school’s Google or MS account. You want to move your files to a new Google account. This can be a new school account or a personal account — doesn’t matter. You’re closing a Google account. Your school is switching from Google to Microsoft. You can transfer the contents of your Google Drive (with some exceptions — like Google Forms) into a format that can be opened in MS applications. A long-term sub is leaving. Subs often are in place over the long term for teachers out on disability, on pregnancy leave, or any number of other reasons that ultimately require that the sub creates extensive files they most likely don’t want to lose. Takeout is the perfect way to let subs take their files with them when they move on. What’s a good End-of-year Tech Show? Jacqui Murray has been teaching K-18 technology for 30 years. She is the editor/author of over a hundred tech ed resources including a K-12 technology curriculum, K-8 keyboard curriculum, K-8 Digital Citizenship curriculum. She is an adjunct professor in tech ed, Master Teacher, webmaster for four blogs, an Amazon Vine Voice, CSTA presentation reviewer, freelance journalist on tech ed topics, contributor to NEA Today and TeachHUB, and author of two tech thrillers. You can find her resources at Structured Learning.